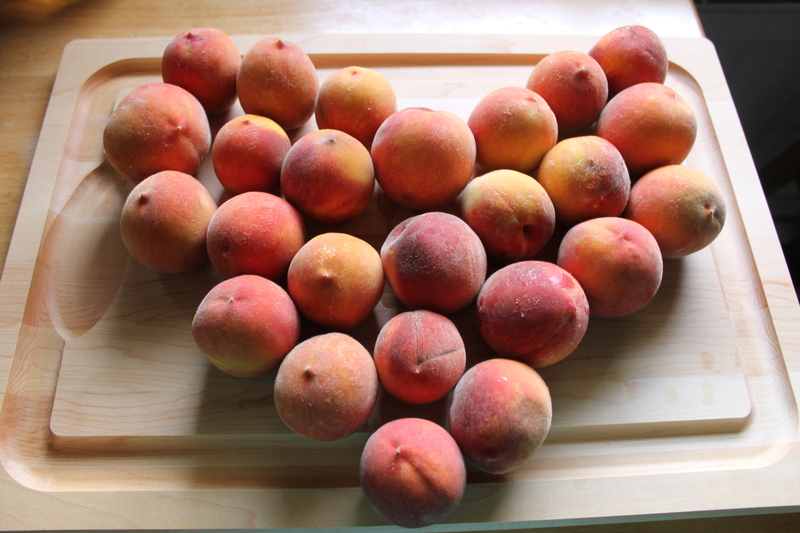 Posted on September 4, 2014 by E.M.
It’s peach time! The boyfriend’s backyard tree is just bursting with peaches, so this past weekend I picked a few to make a cobbler. I looked up some recipes online and I chose one that had two many complaints about one thing: it’s too sweet! Well, that’s my kind of recipe. It turned out oh so sweet and so wonderful! The texture is more like a cake or bread pudding than a flaky cobbler, but I actually liked that better. If I had time, I would just make dozens of cobblers and freeze them for the year. Melt butter in a 13×9 baking dish. In a bowl, combine dry ingredients (use just one cup of sugar!). Add milk to form a batter. Pour over butter, but do not stir. Bring the remaining cup of sugar, peaches, and lemon juice to a boil over high heat. Pour over batter, but do not stir. Sprinkle with cinnamon and nutmeg. Makes 10 servings of 325 calories each.